A short hike up the valley/canyon from the Blue Lake Campground to the base of Blue Lake Dam. Access may be limited in times of high water flow. Accessibility depends on the conditions along Blue Lake Road as well as the amount of water flowing over the dam. This is from the Blue Lake Campground to the base of the dam. Just after the start of the trail it is necessary to cut down to the stream. The main trail (such as it is) can be found by going back up the bank almost immediately. Once the trail is found, it is relatively easy to follow. When the trail runs out, stay along the stream until you get to the dam or can go no further due to water. Most of the first section follows what appears to be an old road bed that was probably used during the construction of the dam. Much of this road bed has been washed out or overgrown. Parts of the trail are very narrow or completely gone due to washouts. The latter section has no real trail. Just pick your way along the rocks along the river bed. During times of low water this is not difficult. During high water, it may be inaccessible. Take Blue Lake Road to the large parking lot at Blue Lake Campground. The trail starts behind the building located at the upper end of the parking lot. There is stair access over the large green pipe. 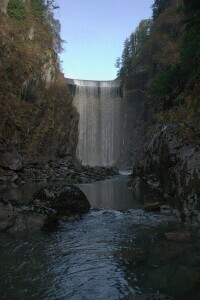 There is a falls about half-way up to the dam that comes down the side of the canyon. The stream that is the source of the falls comes from Beaver Lake.